Cellist Matthew Johnson was recently appointed to the position of Associate Principal Cello of the Utah Symphony. He is a graduate of the University of Southern California, where he studied with Ron Leonard and Andrew Shulman. 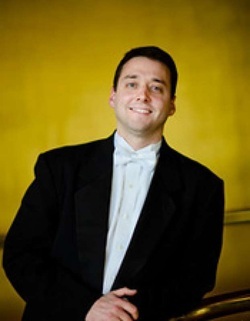 Prior to his appointment with the Utah Symphony, Matthew was a member of the Kansas City Symphony for six seasons. While in Kansas City, Mr. Johnson was an active chamber musician as a member of the Bach Aria Soloists and the cello quartet, CelloRondo. In addition to maintaining a private teaching studio, Matthew was a faculty member of the Kansas City String Quartet Program. He has also participated in music festivals such as the Sarasota Music Festival and the Schleswig-Holstein Music Festival in Germany, where he served as principal cellist. A musician with Utah roots, Matthew moved to Salt Lake City from Massachusetts when he was twelve years old. He was a student of Richard Hoyt and Utah Symphony cellist, John Eckstein. While attending Skyline High School, he performed with many ensembles led by musicians of the Utah Symphony. In 1997, Matthew was featured as a soloist with the Utah Symphony, after winning the Symphony's Youth Guild competition. Mr. Johnson is married to violinist and former Kansas City Symphony member, Tina Cho Johnson. They have a young daughter, Ella.